While going through the latest issue of On Makeup Magazine (every pro artist or newbie artist should get this magazine), I noticed Kevin James Bennett was one of the two artists featured in the “Kit Focus” section. 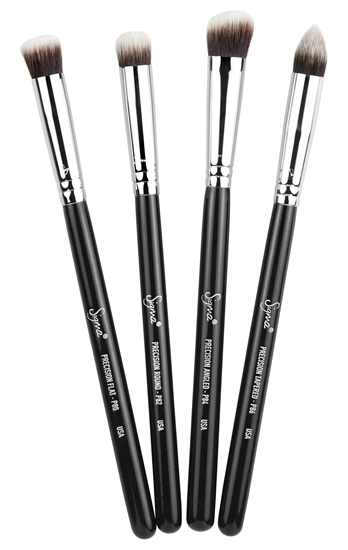 One of the items featured in his “Kit Focus” were the Sigma Synthetic brushes from the Sigmax collection! The collection was launched last month, and has received numerous great reviews (check Silver Lips review here). Most of the brushes I own are Sigma brushes. They’re good and affordable. I am sure these are just as great, otherwise, I doubt KJB would use them in his kit. The NEW Sigmax Synthetic Collection is comprised of eight synthetic brushes that look to be perfect for applying cream, liquid or powder products. The Sigmax Synthetic Essential Kit contains eight face brushes specifically designed for a high definition, flawless makeup application. This kit features our exclusive Sigmax synthetic filament, which was created to perfectly apply powder, cream and liquid products onto the skin without absorption into the bristles. The shape, density and height of each brush was designed to compliment the different areas and shapes of the face. The Synthetic Essential Kit has everything you need to achieve a perfect and flawless look! You can purchase the entire set for $99,the Kabuki set for $56, and the Precision kit retails for $49 or you may purchase each brush individually. All sets are available online at SigmaBeauty.com. Do you own any of the SIGMAX brushes? Which are your faves? If not, will you purchase? I own a F80 and loved it for the first few applications…. easy to use, great for applying the product. Then, it started picking up too much product and application was uneven. If I want to keep it functional I need to clean it once a week (this is, for putting on the creme blush ONCE a day). Way too much maintenance IMHO. Brushes used with creme products should be cleaned more often anyway. I love the F80, best foundation and powder brush for me. I want to get a few more out of the Sigmax collection.